Marisol (from Ellen's "Hard Love") has taken a year off before college to write a novel and - yeah, she's planning this - fall in love. She has to deal with Gio (the straight guy that fell for her last year even though he knew she only likes girls) being in her writing class. There's also a newly out lesbian, Lee, who has a complete crush on Marisol. But her writing teacher, Olivia, is everything Marisol wants - and they start a teacher-student romance. But is Marisol seeing things clearly? Or is she too blinded by love to see the lies? 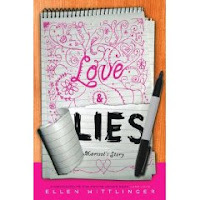 Add your review of "Love & Lies: Marisol's Story" in comments! I personally did not like this book very much. A synopsis: "Hi, I'm Marisol. I'm a lesbian writer. And my teacher is hot. I'm a writer, and I like girls. And did I mention my teacher is hot? No, wait, she isn't anymore. Goodbye." To me it seemed more like a pseudo-edgy collection of lesbian tropes sewn together with a shaky plot and annoying characters. And Marisol's "novel" is a glorified autobiography. P.S. "Marisol" sounds like a window cleaner.